Equities start the day higher as July, and by proxy your summer, comes to an end. That’s right, summer is over, all of our kids go back to school in August and there’s a college football game in 26 days. NFL training camp is in full swing, it’s getting dark at 810pm, and my grass stopped growing so pack up the swim gear and get those rakes out because Fall is upon you. Speaking of fall, how about this move in FANG the past few sessions? It’s like all of a sudden people decided that they’d had enough of Zuckerberg spying on them, two day shipping of stuff they don’t need, one or two good movies on the TV, and their browser tracking their every movement. The only one left, AAPL, reports after the bell so at this point it’s up to Tim Cook to stop the bleeding. It’s more than just FANG being sold though, we’re seeing a rotation from Growth towards Value. This from the fine people at Nomura: “The collective three-day move in U.S. “Value / Growth” has been the largest since October 2008--a 4.3 standard deviation event relative to the returns of the past 10 year period.” My pal Ross in London, who managed to work the word “multicollinearity” into his daily sales note (you’re my hero), points out that growth weakness is just a symptom of “all the big winners being puked out” so however we want to frame it people appear to be taking profits in their favorite high flyers. Now this isn’t necessarily a bad thing, rotation can be the life blood of bull markets, and if this money finds its way to sectors like Financials or Industrials I’ll feel good about the past few days. But there was bound to be pain associated with selloffs in FB, NFLX, AMZN, and GOOGL, they are over owned by the entire planet, and any rotation will not go gently into that good night. So, like when I tried Keto, let’s see whether this is the start of a trend of just a temporary blip. After the open we got a quick pop on the heels of this headline U.S., China Seek to restart talks to defuse Trade War. Honestly, to me, the risk from further trade war talk is asymmetric to the upside. We’ve seen nothing but negativity from both the US and China and the market hangs in there. Imagine what would happen if China caved or both countries came to some kind of amicable solution….I mean we got a 25bps rip off a RESTART of talks! Solid price action from Industrials today, especially Transports. FDX gained 2.5% and DE…John freaking Deere…rose 4.6% after reporting better than expected earnings. Other winners were ILMN, XYL, CMI, and KLAC. Losers were IPGP -25% (who knew a laser company could blow up), AMD -4.5%, UHS -2%, and CMG -7%. Can we talk about CMG for a second? Apparently someone got sick in an Ohio establishment and it got reported on iwaspoisoned.com. What in the heck is iwaspoisoned.com and how is it so powerful it can hit Chipotle for 7%? What’s to stop some nefarious hack from shorting a restaurant stock and flooding this website with complaints? BTW, it’s National Avocado day (here’s how to pick the best ones) so wander down to your local tex mex joint and enjoy the fruit of the alligator pear. By lunch we were sitting near the highs, 2821, up 0.66% while I wondered what the heck PNRA was doing with this thing. Is it also National Carb week? Can I get a side of bread with my bread bowl filled with pasta and bread? The rest of the day saw a small selloff when the WSJ reported that trade negotiations were going slow and we closed at 2,818 +0.56%. So look, July wasn’t all that bad, in fact it was pretty good even with the FANG selloff. Earnings have been solid, macro data was steady, trade tensions eased, and Transports closed at an all-time monthly high. In the midst of all this we are seeing articles like these from major Wall St firms: Prepare for the biggest stock market selloff in Months says Morgan Stanley. I mean imagine what we’d be reading if none of those things happened! Let’s clarify one thing before we end: I am not bearish right now. I do not think a meltdown is imminent nor do I think the economy is close to a recession. I think we continue to chug along for the next 12-18 months like we have been all along. Am I cautious from time to time? Sure, but so is everyone else, that doesn’t mean I’ve changed my overarching theme. Succinct Summation of the Day’s Events: One positive trade headline was enough to overcome FANG malaise. S&P500 in July +3.6%. The beat goes on. 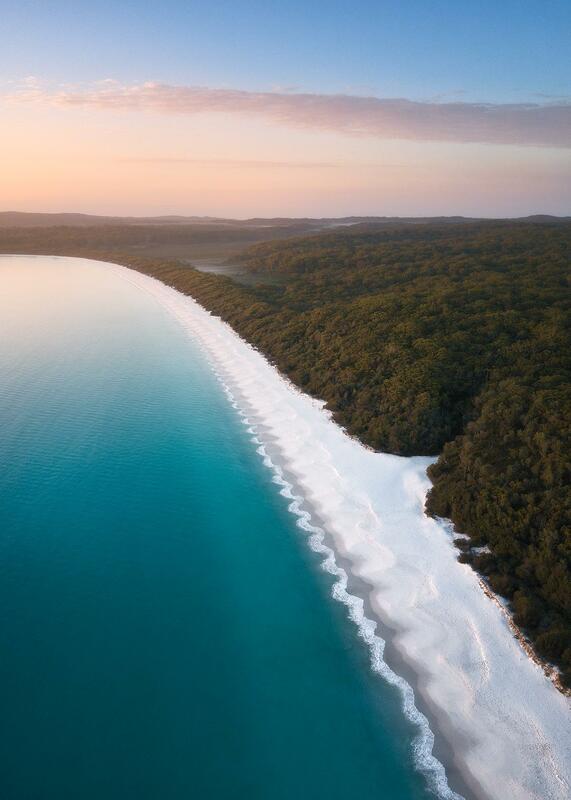 Apparently Australia has a beach with the whitest sand in the world. What are some of the characteristics of Willing Losers? People who don’t invest in themselves. One of the best investments you will ever make does not involve the markets but rather investing in yourself. Personal finance advice focuses a lot of its attention on saving and frugality but very little on improving your career prospects to make more money. If you’re not willing to spend time or money improving yourself it’s highly unlikely you’ll get very far in your career. Mark Dow tells us who the most dangerous people in the world are: “Smart guys are the most dangerous. They are the most prone to overconfidence and the most susceptible to overthinking–both deadly sins in money management. My response: fight to keep it simple. And I say fight because I have the same basic impulses as everyone else. It is extremely hard to not overthink—all the more so if one has a deeply ingrained fundamental background. ‘Keeping it simple’ for me means latching onto a couple of overarching themes in which I believe strongly and using them to tune out as best I can the macro noise du jour”. I bet I can make you cringe. Not for the faint of heart !!! Tonight’s final link is a quick hit featuring a woman, a man with eggs, a dog and an elevator. I love everything about this thing, I feel like it’s a good analogy for my life.